Our backyard just got a lot bigger with our new Grand Canyon backcountry tour. We'll visit the 1800's, then tour the Triassic period. The land is rugged. The seats are comfortable. Breathtaking vistas without the gift shop. Choose from 3 Hour Tours, schedule a Private *Jeep Tour around Zion or the North Rim of the Grand Canyon, or combine your private Jeep tour with a spectacular helicopter flight around Zion. Hover & click on photos for more info. Save 10% by Booking 2 Different Tours for the Same Day! Book your first trip online, then use the promo code you receive to book your second trip & activate discount. Zion National Park contains some of Earth’s most spectacular scenery, yet the vast majority of its 3 million annual visitors will never experience Zion beyond a few feet of the pavement. Those who do know that nature’s best kept secrets are reserved for those who venture beyond the well-worn trail. Our tours makes it easy to experience many of southern Utah’s hidden treasures. We take the road less traveled to show you places that most visitors see only in photographs, including stunning panoramas and breathtaking overlooks that have remained unchanged for a million years. See thousand year old Native American rock art, an authentic ghost town that became a Hollywood favorite, and wildlife that doesn’t behave like it lives in a zoo. 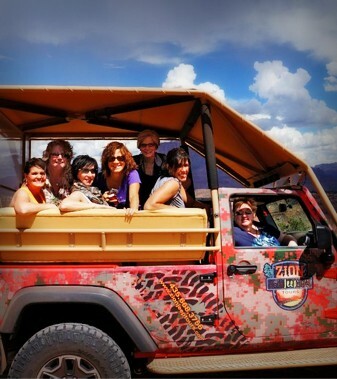 Choose from our safari, or take a Private *Jeep Tour to wherever you want to go. You can even combine your private tour with a Zion 360 Tour. The Mesa Vista safari departs from Majestic View Lodge in Springdale. The 3-hour “Mesa Vista” Safari follows North Creek toward the Kolob Terrace, then explores Smith Mesa. This area provides spectacular panoramas which stretch from West Temple to the Kolob Fingers at the northern end of the park. Answers to a few Frequently Asked Questions to help you make the most of your backroad experience. Private *Jeep Tours: Any Springdale location. Please check the weather forecast (click the + sign at the top right corner of this website) a few hours before your trip. Remember that temperatures will drop about 10 degrees for every 1000′ elevation increase. Safari tours will climb approximately 1500.’ while private tours could climb as much as 4000.’ We do carry blankets just in case it cools off more than expected. Also, please keep in mind that the weather can change very quickly in the desert southwest, especially during our monsoon season of July – September. Clear mornings can often become rainy afternoons in the late summer. Mild rain will not cause cancellation, but heavy rains may limit our ability to travel dirt-roads. We will notify you of potential schedule changes a few hours prior to departure time. We Will Show You the Places That Others Will Only See in Photographs! Click the button to learn more about each tour, or call 1-435-668-3756 and we'll be happy to help you. 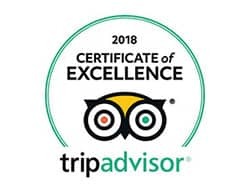 We’re proud of our Five Star Trip Advisor rating! “My wife and I recently traveled to Zion for a quick weekend get away. We hiked the Narrows in the Park and also decided to take a Private *Jeep Tour with Zion Outback Safaris. Todd was our driver and he was extremely knowledgable about the park and the surrounding areas of Zion. He discussed local history (geology and human history) while taking us to some of the most beautiful vistas you can imagine. Todd was a really good guy and really funny too. We had a blast and would highly recommend this to anyone looking to see beautiful areas that surround the park. Also the ride in the Jeep was extremely comfortable, even when we were off-road on some pretty rough roads. “Very easy to book via email and happy for us to pay in cash on arrival. We went for the Zion Mesa Vista Tour in the early evening. There was us and another couple so we were able to freely move around the *Jeep to take photos from both sides. Cold water was also provided which was a nice addition.